Save SAR 280 (70.18%) – Earn 11 Shukrans What is Shukran? Shukran is the Landmark Group’s award-winning loyalty programme in the Middle East, which allows you to earn Shukrans when you shop any of our brands. 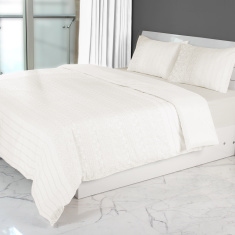 Pick this embroidered duvet cover set for your bedroom and enhance the overall look. The soothing tone and soft material will help you to relax and have a sound sleep.